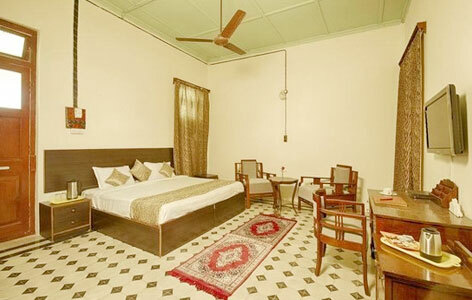 "Offering best comforts with the touch of ancient charm; Vijay Vilas Heritage Hotel apart from being a preferred accommodation, it indeed is one of the topmost attractions of Mandvi city. The interior of the hotel has a simple theme that focuses on the elegance that prevailed during the historical era. Apart from this, actors like Amitabh Bachchan, Shahid Kapoor and Sonakshi Sinha too have spent amazing time here in order to shoot for important projects like Gujarat Tourism and R Rajkumar. 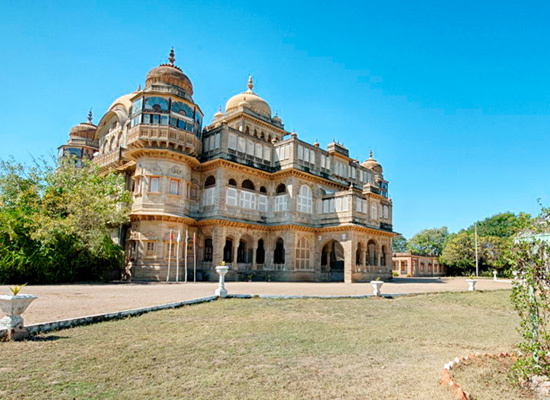 The palace dates back to the reign of Maharao Shri Khengarji III (King of Kutch) in 1920. 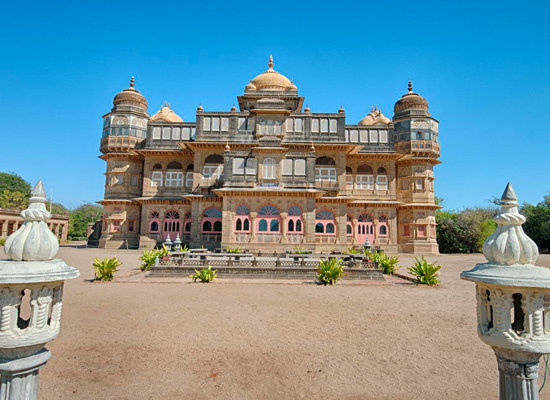 The king intended to build a summer palace for his son, Shri Vijayaraji and thus Vijaya Vilas Palace got its name. The palaces of Orchha and Datia were the inspiration for this palace and for more charm; Rajasthani architectural elements were further added. The palace is surrounded by lush gardens, fountains and water channels. Craftsmen from Jaipur, Bengal and Saurashtra were called upon to ornate the palace with jalis, jharokas, chhajas, chhatris, murals and colored glass work. Suites: These rooms with their plush designs and state-of-the-art amenities offer the best in terms of luxury and comfort. 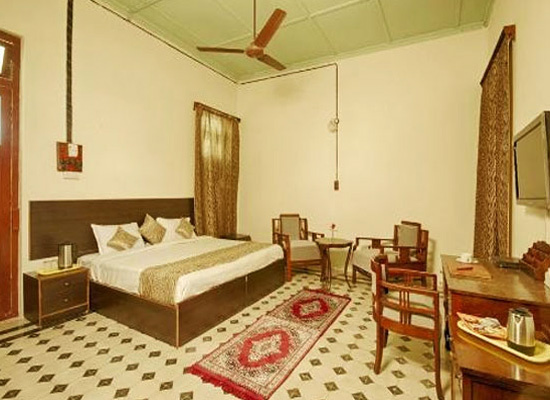 Rooms: These elegantly designed rooms flaunt the magic of ancient era as the vintage furniture adds charm. Luxurious AC Swiss Tents: The feeling of living in a tent can never be the same; as these tents come with brilliant interior and updated facilities. 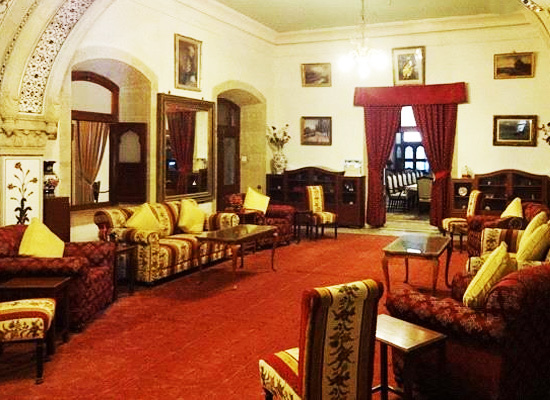 Café Palace Restaurant is the dining area of this hotel and offers multi-cuisine dishes. Its specialty is the rare Eastern Cuisine. You can either choose to dine in the well-designed restaurants or can order food and savor it in the comfort of your room. Mandvi is a fortified town encircled with 8 meter tall walls. Lying on the banks of Rukmavati River, this is a busy little city with a shipbuilding yard. Local artisans construct handmade wooden artforms for Arabian merchants. 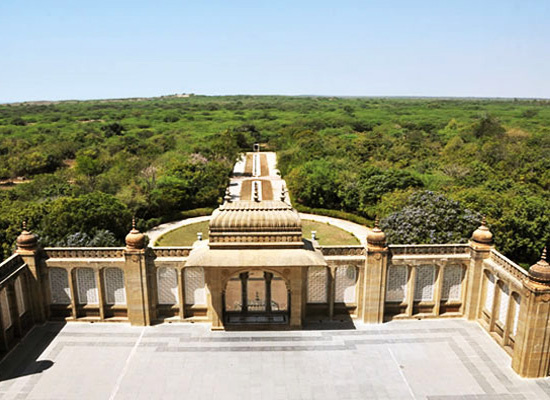 Mandvi Beach, Mazar-e-Noorani and Vijay Vilas Palace are some of the best tourist attractions of Mandvi.